At the vet with Max just a few minutes before he was put to sleep. This past Thursday evening my sister called to tell me that Max, our family dog of 15+ years, had collapsed in my parents backyard and wasn't doing well (he was dying of colon cancer). My parents were away at Girls Camp so she called my brother Ike to come and help her take him to the vet to be put down. As soon as I got off the phone with her I went into Bryson's room to help him get ready for bed and while doing so I talked to him about what was happening to Max. I told him that something very sad was happening to Max--that he was very sick and would be dying soon. We talked for a little bit about death and what happens after we die and he seemed to understand and take it okay. In his bedtime prayer he prayed for Max and then I tucked him in, gave him two kisses (one from me and one from Mommy Kim) and then left his room so he could go to sleep. A few minutes later as I walked past his bedroom, I could hear quiet sobs coming from his room. I opened the door, moved closer and asked him what was wrong. He couldn't even talk and just kept crying. I asked him if he was feeling sad because of Max and through his tears nodded his head "yes." I was surprised by his show of emotion because I wasn't sure he fully understood the concept of death, but I guess he really did. The thought of Max dying made him feel so sad he couldn't hold back the tears. As he cried I held him in my arms and tried my best to help him feel better. At about that time, Taylor called again and said she and Ike (& Amy) were on their way to the vet and invited us to come. I wasn't sure that was something I wanted Bryson to see but when I told Bryson about it he was adamant on going because he wanted to be able to say goodbye to Max. When we arrived at the vet it was hard to see Max in so much pain and to know he was going to be gone soon. While we waited for the vet to come into the room they put us in, Bryson and I knelt on the floor by Max and Bryson gently touched his head and just sobbed and sobbed. We talked about how lucky Max was because he would get to be with Jesus and free of pain soon and that someday he would live again. Bryson was so cute and thanked Max for being such a good dog and for always playing with him at granny's house. 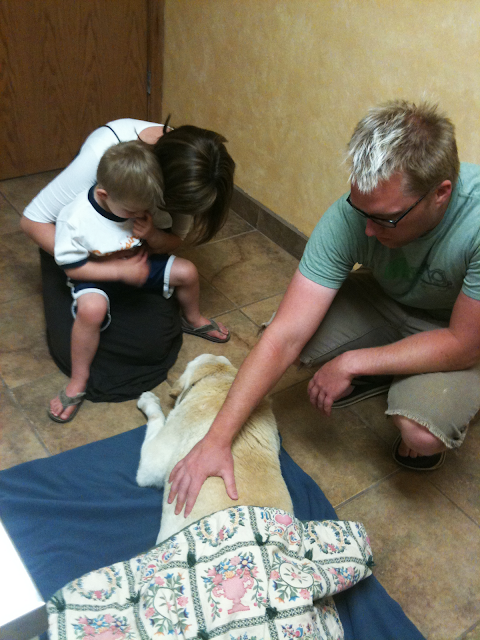 After we said our goodbye's the vet came in and gently put Max to sleep. As we drove home, Bryson continued to cry. He was so heartbroken. When we got home we said another prayer and Bryson asked Heavenly Father to comfort him and help him feel better. Bryson snuggled with us in bed and cried himself to sleep that night. The next morning Bryson woke up totally happy! I asked him if he was still sad about Max and he said "no." I asked him why and he said "because I know I'll get to see him again someday!" "This week my grandma's dog died. It made me feel very sad and I cried. So I said a prayer and Heavenly Father sent the Holy Ghost to comfort me. I know if you ever feel sad or afraid, the Holy Ghost can comfort you too. In the name of Jesus Christ, amen." He was so brave and did such a good job. Even though saying goodbye to Max was hard it was such a great testimony building experience for Bryson and I know it's something he'll never forget.